Killdeer are known for their fake broken wing act too, where you will see them limp and flap their wings helplessly as if they are hurt. They really aren’t injured, they are just trying to fake you out and lure you away from their nest or their babies. My husband and I just encountered this behavior a few weeks ago (photo above). 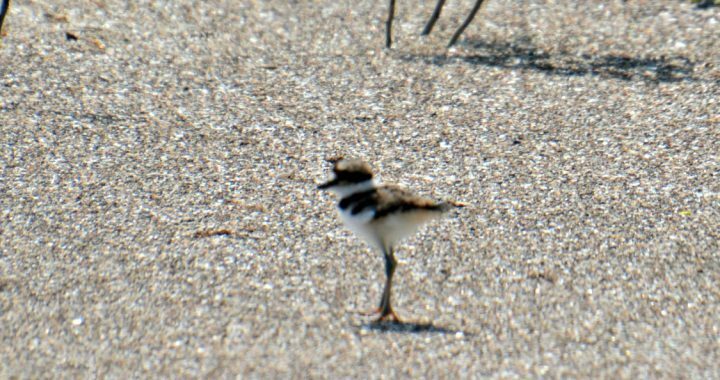 As soon as I saw the mama acting like this I of course wanted to see the babies as I had never seen baby Killdeer before. I stayed a good distance away so as not to disturb them and spotted four of them (see one baby in photo below) through my binoculars as they scurried along in the gravel. Such an enjoyable sight to see! 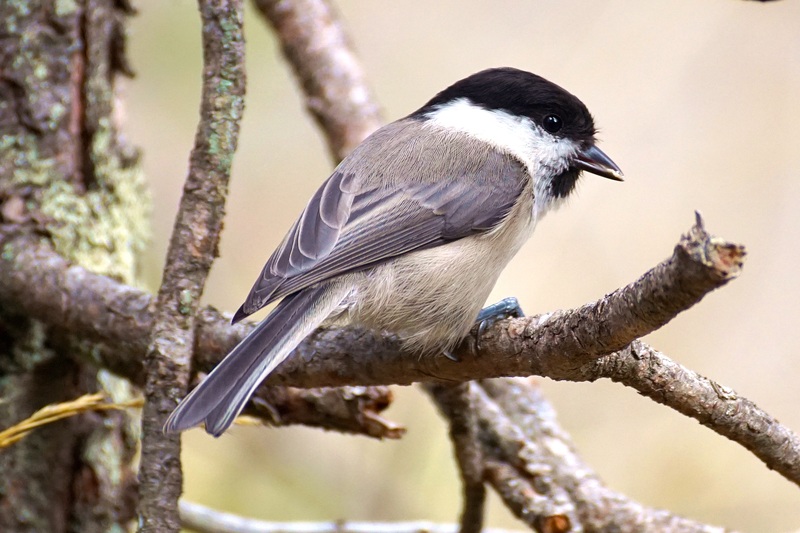 To attract a mate, a male may continuously make a two note call which can last for hours or it will scrape at the ground as if it is building a nest. Once a male and female mate both build a nest where they scrape an indentation into the ground (usually gravel) right out in the open. They may add some rocks or pieces of shell to camouflage it. They use their fake broken wing display to keep predators away. Killdeer are precocial birds meaning that once they are hatched they pretty much hit the ground running. When their feathers dry they are able to walk and leave the nest on their own. This is unlike altricial birds such as eagles, hawks, and woodpeckers that are helpless when they are born and need the care of their parents for a while. 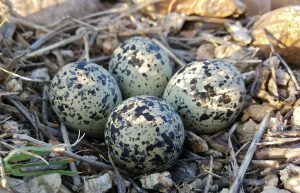 The female lays 4 to 6 eggs that are speckled blackish-brown. Incubation takes twenty four to twenty eight days. Killdeer run several steps then halt as they peck at the ground searching for insects such as beetles, caterpillars, and grasshoppers. They also eat spiders, earthworms, centipedes, crayfish, and snails. Both parents tend to their young but the babies are capable of feeding themselves. The young will fly within twenty five days. The male makes the “killdee” call usually during breeding season. It is the largest of the ringed plovers at eight to eleven inches. They are a long, slender bird with a large, round head and large eye with a red ring around it. Adults have two black rings on their breasts. 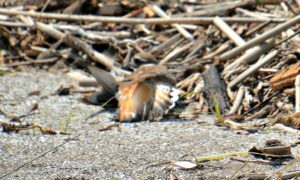 They are brownish tan on top with a white breast with a bright orange rump that you can see while in flight. Killdeer are found in the United States, Canada, and parts of Central and South America. 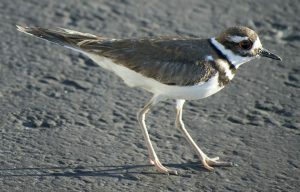 Predators of killdeer are crows, gulls, birds of prey, snakes, foxes, coyotes, cats, dogs, raccoons, skunks and opossums. Both males and females look similar in adult plumage but the male is somewhat bigger. Their feathers do not change with the seasons. Pairs may stay together for the rest of the breeding season or for several years. Killdeer are strong fliers, fast runners, and can swim well in fast flowing water. 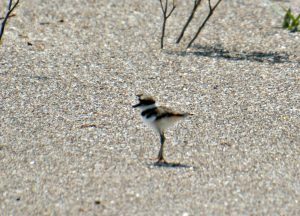 Killdeer can generally be seen anywhere that there is gravel, dirt, golf courses, parking lots, and fields. You know that they are around when you hear their high pitched call of “kill dee” as they fly above or near you. You may also come across one as they try to fake you in to believing that they have a broken wing. They appear to limp along with their wings outstretched looking pitiful as they try to lure you away from their nests which are on open ground, or from their newly hatched young. If you search the area you may be able to spot a baby or two moving about nearby. Just enjoy from a distance though because you do not want to disturb them. If you have anything that you would like to add about this post or have any experiences with Killdeer, please feel free to make your comments below. Posted in Ducks, Geese, Shorebirds and tagged killdeer.